The NSW Indigenous Chamber of Commerce (NSWICC) is a non-Government, not for profit organisation with 12+ years expertise in Aboriginal procurement and economic development. 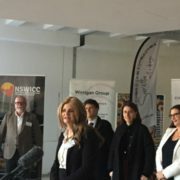 The NSWICC’s core strategy is focused around creating a self-sustaining chamber model that ignites the entrepreneurial spirit of Aboriginal people, accelerates Aboriginal business and employment growth, and facilitates relationships and networks that enable sustained economic and social inclusion. On Friday, the State’s Peak Body for Aboriginal Business, the NSWICC, hosted the NSW Governments Aboriginal Procurement Policy (APP) announcement. The Hon. Gladys Berejiklian, Premier for NSW formally announced the Policy with NSW Ministers, the Hon. Victor Dominello (Minister for Finance, Services and Property) and the Hon. 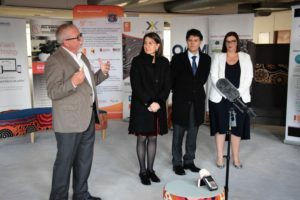 Sarah Mitchell (Minister for Aboriginal Affairs), Members of the NSWICC Board, and 60 NSW-based Aboriginal Business Owners, at the site of the new Djiyagiyulang-Gal Enterprise Hub in Redfern. Just as the first Indigenous Chamber of Commerce was born out of NSW, the NSWICC’s Djiyagiyulang-Gal Enterprise Hub, housed in the historical Black Theatre site within the heart of Redfern, is Australia’s first Aboriginal Owned & Controlled State Business Hub, Incubator and Accelerator. Building on existing business incubator and accelerator programs, the NSWICC will steadily increase offerings through Djiyagiyulang-Gal to become a ‘One Stop Shop’ for Aboriginal Entrepreneurs, Businesses, Enterprising Communities and Government and Industry Procurement. Deb Barwick addresses audience members at the Djiyagiyulang-Gal Enterprise Hub in Redfern. NSWICC CEO & Chair, Deb Barwick. The NSWICC Board welcomed the new Policy and commended the NSW State government for it’s consultative approach in its establishment, ensuring a wide range of NSWICC members and Aboriginal business owners were able to provide relevant feedback and advice, particularly following their involvement within the Federal Indigenous Procurement Policy (IPP), established in 2015. Click here to learn more about the NSW Aboriginal Procurement Policy (APP), or read and download the full Policy here. The Hon. 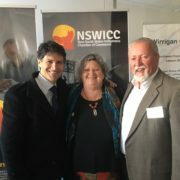 Victor Dominello, with NSWICC Directors, Kate Kelleher & Prof. Dennis Foley. The Aboriginal Procurement Helpdesk, as an extension to the existing NSW Aboriginal Business Portal, both services providing a facility to support Government and other Buying Organisations seeking to purchase from Contract Ready Aboriginal Suppliers. The NSWICC Assured Program to confirm the Aboriginal Ownership and Contract Readiness of NSWICC Suppliers. An Aboriginal Procurement Unit has been established to provide guidance and support to Government Agencies, Government Suppliers and other Buying Organisations seeking to Purchase from Aboriginal Suppliers, seeking to employ Aboriginal people, or general assistance in implementing the objectives of the APP. Networking Opportunities & Forums for Aboriginal Suppliers, Government Agencies and contractors. Quarterly Business Round Tables Co-chaired by the Deputy Ombudsman NSW and the NSWICC to gauge the Policy’s impact. Data Collection Tools designed to effectively measure the policy’s impact and provide solutions for ongoing improvement. Supplier & Buyer Training & Education Programs to improve APP outcomes. Regional Tradeshows to bring buyers and regionally based businesses together. The Hon. Victor Dominello – Minister for Finance, Services and Property, The Hon. 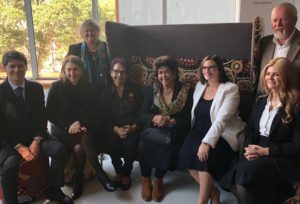 Gladys Berejiklian – Premier for NSW, Kate Kelleher – NSWICC Director (standing), Aunty Jean Hands – Chair, Northern Region Aboriginal Alliance, Aunty Margret Cambell – Dreamtime Southern X, The Hon. Sarah Mitchell – Minister for Aboriginal Affairs, Prof. Dennis Foley – NSWICC Director (standing), & Deb Barwick – NSWICC CEO & Chair. Prof. Dennis Foley – NSWICC Director & Gadigal Elder, delivers a Welcome to Country, with The Hon. Gladys Berejiklian – Premier for NSW, The Hon. Victor Dominello – Minister for Finance, Services and Property, & The Hon. Sarah Mitchell – Minister for Aboriginal Affairs. 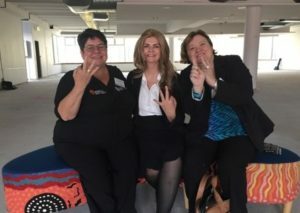 Louise Reeves – NSWICC Membership Liaison & Support, Deb Barwick – NSWICC CEO & Chair, & Rochelle Kirk – Principal, O’Connor Marsden & Associates, showing the 3% Goods & Services Spend Target for NSW Government Agencies. The NSWICC now represents the interests of over 400+ Aboriginal Entrepreneurs and Business Owners in NSW, and as a founding member of the First Australia’s Chamber of Commerce & Industry (FACCI), the NSWICC also connects members and buyers to a powerful growing network of 4500+ Aboriginal and Torres Strait Islander Businesses. Membership of the NSWICC is open to any Aboriginal owned and controlled business. The NSWICC also offers Associate Membership and Partner Opportunities to Agencies and Contractors seeking to excel or maximise their economic impact in Aboriginal communities through the engagement of Aboriginal Suppliers or Employment of Aboriginal Employees. WE PAY TRIBUTE TO ABORIGINAL AND TORRES STRAIT ISLANDER LEADERSHIP WITHIN OUR COMMUNITIES, WITHIN BUSINESS, AND AMOUNG OUR YOUTH.